500 Days Of Film Reviews Horror, Under The Shadows, Starring Narges Rashidi And Avin Manshadi. Shideh (Narges Rashidi) and her family live in Tehran amid the chaos of the Iran-Iraq war. Blacklisted from medical college as a result of political beliefs held during her student days, Shideh feels trapped and frustrated. After her husband is conscripted into the army, Shideh is left alone to protect their young daughter Dorsa (Avin Manshadi). No small task while Tehran is under the constant threat of aerial bombardment. When Dorsa’s behaviour becomes increasingly disturbed, Shideh's superstitious neighbour warns of the presence of Djinn (malevolent Middle-Eastern spirits). Struggling to distinguish what is real from what is not, Shideh becomes convinced that a supernatural force is attempting to possess her daughter. than her potential (or, later on, her well being). Shideh's world suddenly feels small and she is forced to retreat to the home she shares with her husband and young daughter. However, home is far from a place of sanctuary. Shideh lives in constant terror of falling bombs. Masking tape adorns her windows to prevent flying glass and her life is punctuated by horrific alarms that send her building’s inhabitants running for cover to the basement. There is nowhere safe for Shideh and Dorsa to hide as, beneath the fear and anxiety, lurks something unspeakably evil. Under The Shadow takes time to reveal its horror lineage - just enough time, in fact, to make us care about Shideh and Dorsa's fate. Anvari certainly knows his genre with references to Jennifer Kent's The Babadook, Nicholas Roeg's Don't Look Now, Ana Lily Amirpour's A Girl Walks Home Alone At Night and William Friedkin's The Exorcist. The tension in Under The Shadow builds slowly and steadily - until you realise that you are inhabiting the very edge of your seat. Much of this growing sense of anxiety is thanks to the film's powerful performances. Narges Rashidi is simply superb as Shideh. Her terror and desperation are utterly convincing. Meanwhile, in a year of hugely impressive child performances we have Avin Manshadi as Dorsa. She is just perfect in this challenging role. While Under The Shadow has a number of effective jump scares, the film's unsettling chills were what impressed me the most. Without need to resort to blood and gore, Anvari's movie left me feeling deeply unnerved and wonderfully satisfied. horror movies just don’t come around all that often. As Under The Shadow was not screened near me, I watched it at home via Curzon At Home. You can also watch it via Amazon Video. Under The Shadow is the UK’s entry for the 2017 best foreign language film Oscar. 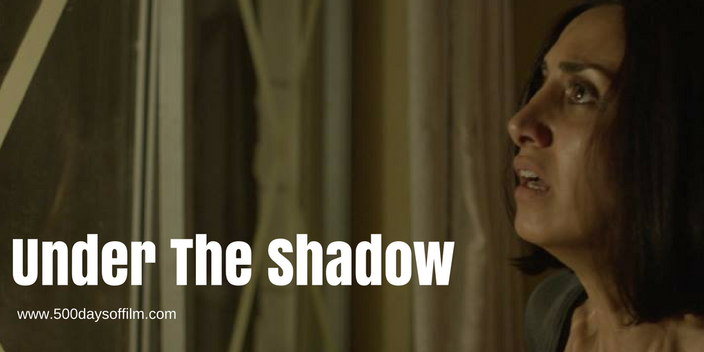 Have you seen Under The Shadow? If you have, I would love to know what you thought of this film. Do feel free to leave me a comment in the box below!